The purpose of the ISS inflatable module would be a simple, limited capability stowage volume, similar in purpose to the currently on-orbit Japanese Logistics Platform (JLP), which serves as a stowage module for scientific equipment from the Japanese Pressurised Module (JPM) laboratory. The module would be certified to remain on-orbit for two years. The module would be a collaboration between NASA and Bigelow Aerospace, with NASA HQ providing funding, the ISS National Laboratory Program providing project management, and NASA providing all Government Furnished Equipment (GFE), which includes the Passive Common Berthing Mechanism (PCBM), Flight Releasable Grapple Fixture (FRGF), smoke detector, fan, and emergency lights. Bigelow would provide the inflatable and inner core structure of the module, and perform all required flight analysis. 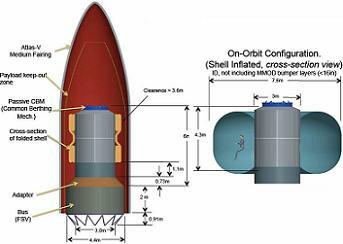 “An inflatable module has a rigid center core where the equipment is typically located and where the fabric is stowed for launch. After the module is berthed, it is inflated resulting in a pressurized fabric shell with a cylindrical core structure that houses equipment, etc.” noted L2 info. In-spite of their soft shell, Bigelow’s inflatable modules are more resistant to Micro Meteoroid Orbital Debris (MMOD) strikes than current metallic-shelled l ISS modules, in part due to Bigelow’s use of multiple layers of Vectran, a material which is twice as strong as Kevlar. In ground tests, MMOD objects that would penetrate ISS modules only penetrated half-way through the skin of Bigelow’s modules. A proposal for an inflatable module on the ISS was outlined at NASA’s Exploration Enterprise Workshop, which was held in Galveston, TX, in May 2010. The proposal shows that the inflatable module would be delivered to the ISS in the post-2013 timeframe, launched atop an Expendable Launch Vehicle (ELV) and rendezvoused with the ISS via the currently unfunded Advanced Rendezvous & Docking Vehicle (ARDV). Given the requirements for three open Common Berthing Mechanism (CBM) ports on ISS for cargo resupply Visiting Vehicles (VVs), and at least two International Docking System Standard (IDSS) ports for crew rotation VVs, it is likely that the Bigelow inflatable module would be berthed to the currently unfunded Node 4. Also known as the Docking Hub System (DHS), Node 4, like the Bigelow inflatable, would likely be launched on an ELV post-2013 and delivered to the ISS via the ARDV. It would be berthed to the forward CBM port of Node 2. 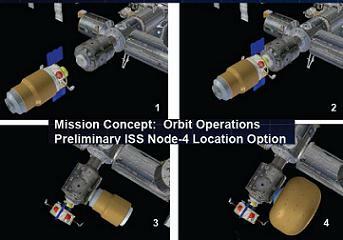 The inflatable module proposal outlined at NASA’s Exploration Enterprise Workshop shows Node 4 with two IDSS ports, and four CBM ports. The same proposal shows that an inflatable module would be attached to either the Port or Starboard CBM ports of Node 4. At this time, however, no berthing location has been decided for the Bigelow inflatable. Research into inflatable technologies was listed number three under NASA’s Flagship Technology Demonstration (FTD) program, and funding for such research was proposed in NASA’s 22nd February 2010 budget proposal. Bigelow Aerospace was founded by Robert Bigelow in 1998. 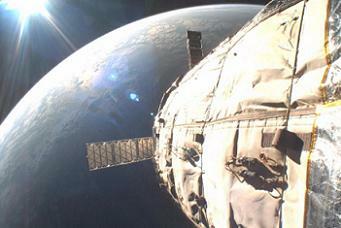 The company is a pioneering world leader in the area of expandable space station modules. Following the cancellation of NASA’s ISS TransHab inflatable module in 1999 due to budgetary and schedule issues, Bigelow licensed the cancelled TransHab technology from NASA via three Space Act agreements. Over the next 10 years, Bigelow invested and researched heavily into inflatable technology, with a view to one day making it available to paying customers in the form of an orbital hotel complex. To date, Bigelow has successfully launched two small, uncrewed inflatable demonstration modules – Geneses I in 2006, and Genesis II in 2007. Both NASA and Bigelow stand to gain from putting an inflatable module on the ISS. Given the fact that inflatable modules could play a major role in any future NASA interplanetary spacecraft or surface base, NASA could gain valuable in-flight data from an inflatable module on ISS, as well as much-needed stowage space. Bigelow would gain confidence in, and operational experience with, its inflatable modules in a crewed environment, confidence which would undoubtedly also be gained by any potential future customers to Bigelow. Given that the ISS is a permanently crewed operational environment, it is an ideal testbed to demonstrate these technologies.